Doing Our Part to Generate Repeat Play for You! There aren't too many things more important at your course than getting golfers there to play, and getting them back over and over again. Of course we recognize this---it's not Rocket Science. However, creating initiatives and reasons for them to be back often can be difficult, especially in markets where there are many choices of courses to play at. We have your answer! You continue to do what you do. Keep the greens rolling fast and true, fairways green, food and drinks fresh and cold, carts charged and clean, and golfers happy. We will provide a monthly competition that pits your golfers against others around the world and their scores will continue to improve the more they play, increasing their odds of winning. The only way to win is to play your course more! 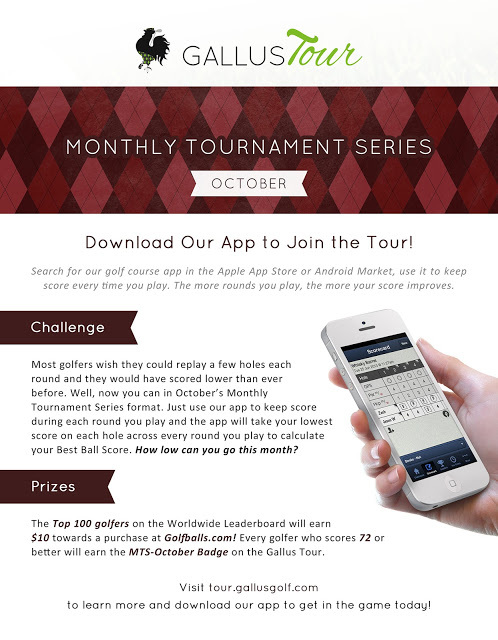 In your App Dashboard, at the bottom of the home page is a banner for the Monthly Tournament Series. At the bottom of that banner are three buttons. One is to "View" the worldwide tournament standings as they are currently. The second is to "Promote" the MTS to your golfers through a variety of materials our graphic design team has made for you to use. The third button is to see "My Top Golfers" and know who from your course is competing. All they have to do to compete is keep score for 18 holes in your app! Then, at the end of each month Gallus Golf awards the top 100 golfers worldwide with a gift card to GolfBalls.com to purchase all types of golf merchandise. The more they play, the better chance they can win, and you win by having them there more often. Feel free to reach out to me with questions on how to promote this at your course and what some clever push notifications would be to get your golfers more engaged with this competition. rob@gallusgolf.com or 858.437.9262.